Callum Wilson's second goal in three games earned Bournemouth a 2-2 Premier League draw at Brighton. 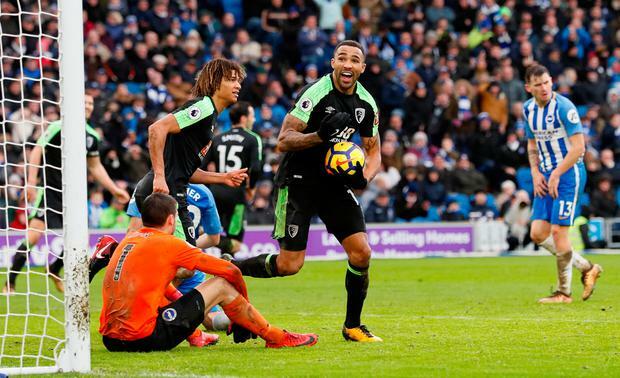 The former Coventry striker's reflex finish secured a point for the Cherries at the Amex Stadium, after Glenn Murray's strike had left the hosts eyeing victory. Brighton forward Jose Izquierdo produced two assists in an unselfish display, teeing up first Anthony Knockaert and then Murray. Steve Cook's looping header had the visitors level at half-time, however, and Wilson snaffled them a point with his fifth league goal of the campaign 11 minutes from time. Wilson's increasing sharpness represents a clear boost to Bournemouth boss Eddie Howe, with the 25-year-old still finding his feet after two nasty and lengthy knee ligament injuries. His razor-sharp reactions to poke home the equaliser capped an industrious display, and Howe will hope that points to more fruitful times ahead. Brighton took just over four minutes to kick-start 2018, Pascal Gross and Izquierdo combining well to lay the opening goal on a plate for Knockaert. Gross' neat ball let Izquierdo scuttle through on the inside left, and his sweep across goal left Knockaert to oblige with the far-post tap-in. An extended period of drizzle-drenched mediocrity ensued, Brighton content to meander in possession and Bournemouth unable to generate any incision. Murray drew a save from Asmir Begovic when the strike was probably headed wide, while Jordon Ibe fizzed in a shot from distance that was well parried by home goalkeeper Matt Ryan. Steve Cook saw his header from Lewis Cook's corner deflected wide. And then the Cherries struck. In a repeat combination from the very next corner, Steve Cook looped a header home from Lewis Cook's dead ball, bursting Brighton's New Year bubble. From nowhere, Bournemouth were not only level, but also finally playing some football. Wilson strode purposefully into the penalty area only to lose his footing just when it was time to shape for a shot. Gross' latest incisive ball sent Izquierdo clear again, but this time Begovic conjured an instinctive point-blank stop to keep the Cherries level. Ryan batted away a side-footed drive from Marc Pugh, leaving the scores locked at 1-1 at the break. Brighton picked off Bournemouth's passing persuasion to open the second half with another quick-fire goal. The Cherries lost control cheaply, and in a flash Gross threaded through finely for Izquierdo. The Colombia forward raced clear on the inside left, and squared to the lurking Murray when he could so easily have fired on goal. Izquierdo's second selfless act of the match yielded Brighton's second goal, as Murray controlled, steadied, took aim and sent the ball home to get the hosts back into the lead. Izquierdo had the chance to put the game to bed when racing clear after a Bournemouth corner, but dallied too long and blasted straight at Begovic. The Cherries were not finished either, Ibe's scuttling drive striking the base of the post before Ryan tapped the rebound to safety. And when Wilson pounced after a prolonged stint of pinball-style hacks back and forth in the box, the Cherries had their share of the spoils.